An upper air low is pulling west of the Yucatan peninsula. It is creating a divergent flow aloft over the western Caribbean which is favorable for development. So far there only appears to be a surface trough, no closed low. Forecast models show a low forming in the next 24 hours in the western Caribbean and over the Yucatan peninsula. After this, if the low develops, the system may move toward the eastern Gulf early next week. The tropical disturbance has not gained any organization since last evening. 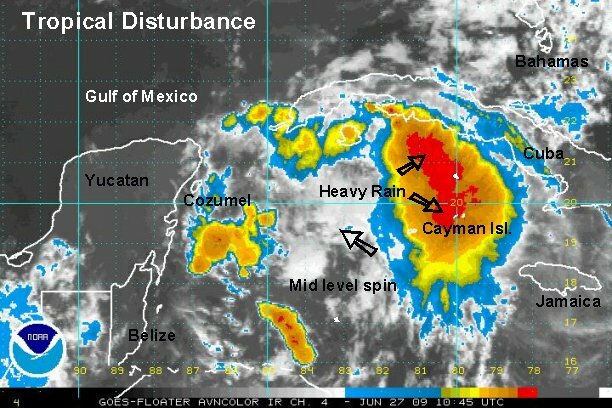 The deep burst of convection has drifted northeast past the Cayman Islands and toward southern Cuba. A mid level spin appears on the satellite imagery, but Quickscat does not confirm a surface low. The visible satellite imagery will give a better look at the structure of the disturbance in a few hours. Forecast models show some development once the disturbance moves into the southern Gulf of Mexico drifting in the direction of southwest Florida by Monday. Satellite imagery shows outflow boundaries moving into the southern Gulf. This indicates that a surface low has likely not formed yet, even though the convection is looking more impressive. A weak surface low or vorticity is moving over the southern Yucatan peninsula. Development chances may increase tomorrow if a low can form in the southern Gulf and convection persist. Interests in the southern Gulf and southwest Florida should follow the progress of this tropical disturbance. 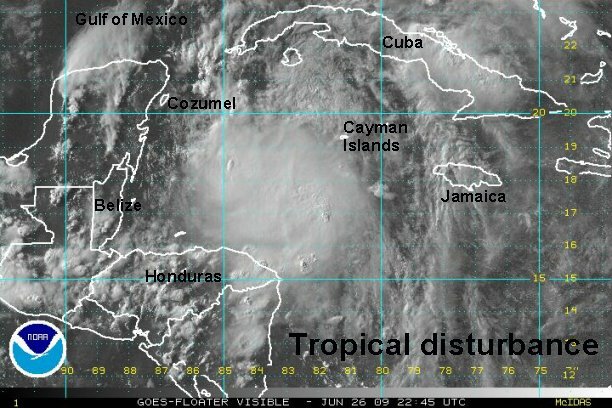 The tropical disturbance in the northwestern Caribbean Sea and southern Gulf of Mexico has not continued to develop. I.R. 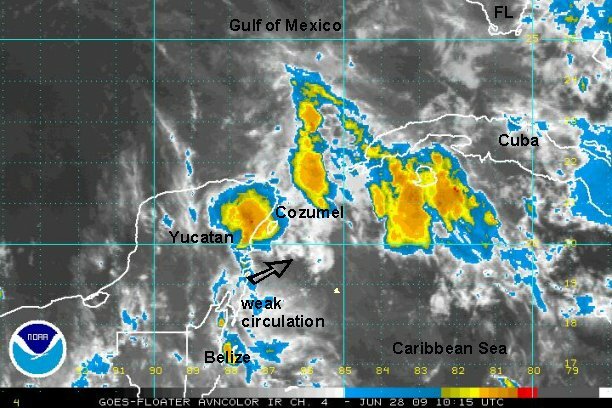 satellite imagery seems to show a mid, or possible low level circulation southeast of Cozumel. Another possible position for a weak surface low is in the southern Gulf. Quickscat has not confirmed a surface low in either position. Visible satellite imagery in a few hours will help disclose what type of organization we have this morning. There is still some potential for limited development over the next few days. Interests in the southern Gulf and southwest Florida should follow the progress of this tropical disturbance. 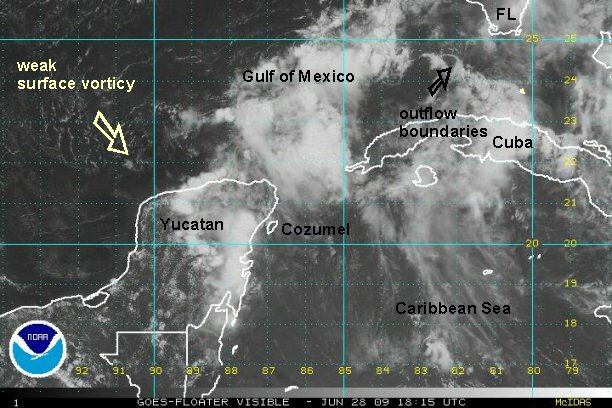 The visible satellite imagery shows no developed surface low, only a weak surface vorticity north of the Yucatan peninsula with no convection. 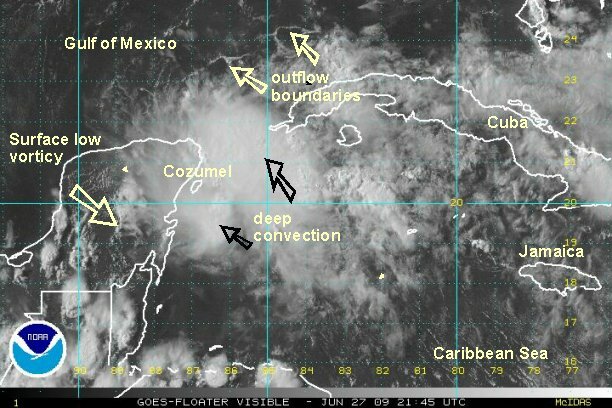 The convection to the east of the center shows several outflows, indicating no sign of development either. Some heavy storms still may affect southwest Florida over the next couple of days. This will be the last update on this tropical disturbance unless conditions change.